Jérôme Thierry – Permaculture and collective intelligence passionate, he co-founded Céret-en-transition. He organized two Permacamp. After working in renewable energies, he participated in the creation of a democratic school and more recently became enthusiastic about Monnaie libre (~Free currency). Jérôme offers immersive formations in Pourgues around Permaculture and democratic governance. On one side we have democracy. A term widely used in our civilization and often misunderstood. (nota bene : a representative democracy is neither direct nor real). In Pourgues, as in democratic schools, democracy is set up by a framework, a governance, which intend to defend the freedom of each one to participate equally in the decisions, and to prevent another authority than that of the collective to operate. In this way it protects from a takeover, putsch or other authoritarian violence. On the other hand, we have permaculture and its very broad spectrum. Again, it is a concept often misunderstood because so broad, global and conceptual that its approach in some videos or conferences is often not sufficient enough to understand the depth of possible entanglement with ... almost everything! Through my meetings, those who seemed to me to have grasped the meaning of permaculture all had the impression that this notion achieved to reunite a lot of domains, considered different or to be differentiated, into an extremely coherent project or action. (An idea well illustrated by one of the principles identified by the fathers of the concept, Bill Mollison and David Holmgren, see below: Integrate rather than separate). So you may have understood it too, this notion is not a way of practicing gardening, nor an agricultural or managerial technique, nor a way of building an ecological house or a local economy. 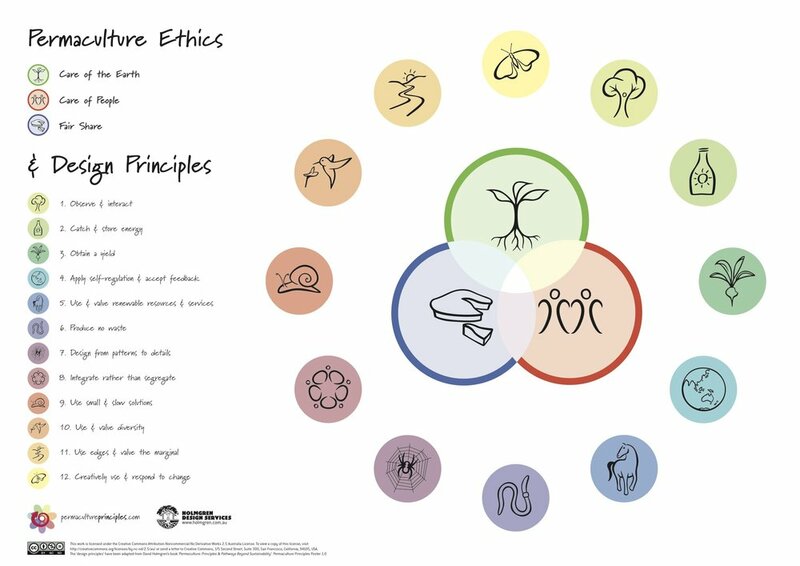 We will go as far as to say that permaculture is simply a systemic science, ie a study and approach of all types of system by taking into account all of its characteristics and purpuses. So we are not going to say "mulching your garden is permacultural", but perhaps: having thought to put the pond near the garden, in the shade of an elderberry which will attract pollinators and generate biomass, not far away from home and from the composting area useful for its fertility, with pedestrian paths made of wood chips, blocking weeds and facilitating proliferation of the mycelium network, benefitting to almost all plants, etc, etc. It is easy to understand then that the designer requires a minimum of knowledge of the elements that make a system how it is; in my example: the various functions of a tree, a pond or a compost, but also the needs of plants, their way of interacting with their environment, etc ..., without forgetting to have questioned what the gardener seeks to obtain from his creation. But then, what about this reconciliation between democracy, which is an organizational technology, and permaculture, a systemic science? Just like market gardening on a living soil is a proposal for a permacultural response to an intention to produce vegetables while paying ethical attention to Nature and to Human beings, or that the Monnaie libre (~Free currency) is a permaculture proposal for the implementation of a exchange tool respecting these same principles and ethics; democracy is, in my opinion, the most pertinent way, currently available, of organizing and facilitating social interaction between human beings, and of building a society enlighted from the beauty of each individual. The democracy that we have implemented in the Village de Pourgues responds to the characteristics of the human being, in particular, in my opinion: in its permanent need of evolution, thus of emancipation, in its highly social character where the interactions are essential to build all its culture, in its basic needs that would be, besides food and air, physical, psychic and affective security, or in its need of cohesion when decisions and choices must be made for a big number. And this is even the genius of this "good design! ", Because the "inventors" of the concept of democracy have been able to set up an extremely intelligent and ethical system, beyond what would have allowed a cleaved or non-holistic approach, retaining the notion of authority, to define and maintain a common framework, placing it in the hands of all, and therefore not a single or a minority. The concept of democracy that we live in Pourgues on a daily basis is an excellent example of the Permaculture principles applied to the challenge of a community life project. This will have required, among other things: to understand how an individual is best builded, from birth to death, and the need for a common framework totally transparent and whose modification is within the reach of everyone regardless of age, gender or hair color. We have thus given birth to a system, an organization, an "us", that feeds our needs and serves our goals of freedom, well-being, individual and collective development very effectively. In any case, I have the impression, after a year and a half of collective life, that we meet with a certain success the challenge of living together,  probably an essential cornerstone to resilience in a world that is running out of division, authoritarianism and disengagement. And you, how do you design your lives? Newer PostI do what I want !